Altair released their HPC workload manager, PBS Pro, as open source. SolidWorks 2017 Beta has been launched. OpenFOAM 4.0 was released with improvements in rigid body dynamics, turbulence modeling, run-time processing, and more. Engineering.com reports on a new CFD project in Autodesk Labs, Project Clarissian, which is now available for public participation. Flow Science released FLOW-3D Cast v4.2. Simulation of gear box oil flow using FluiDyna. Image from Engineering.com. Click image for article. Researchers used CFD to help ships pollute less by exhaust gas abatement. From the article This is Your Brain on Yoga (click image for article) comes this example of gratuitous meshing in graphic design. Apparently, yoga meshes your brain. Thank you, alert reader Dan for this tip. Tecplot was named one of Seattle’s top 100 workplaces. ERCOFTAC is offering a 2-day course on Uncertainty Management and Quantification in Industrial Analysis and Design at Ghent University in Belgium on 27-28 October 2016. The International Conference on Computational Physics, Mathematics, and Its Application will be held in Tokyo on 7-8 November 2016. Sometimes the fluid makes its own mesh, or at less polygons that look like mesh cells to me. 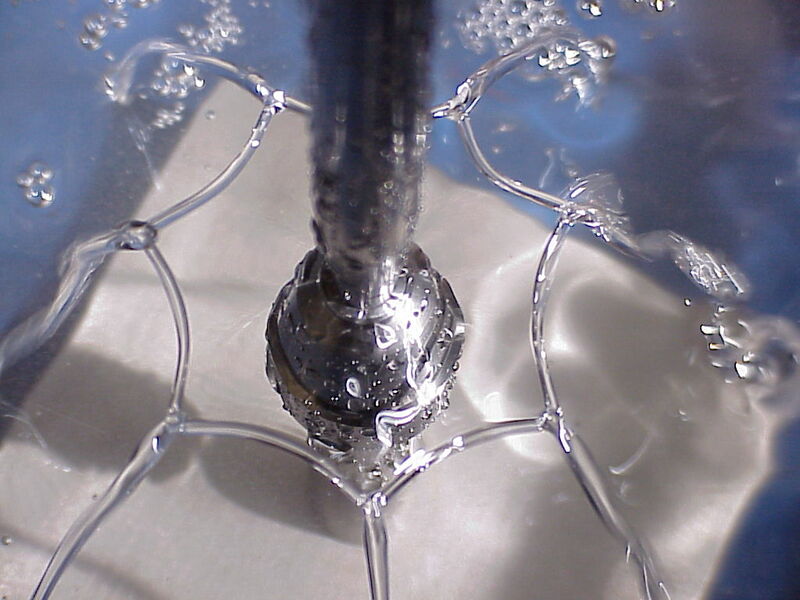 The image below shows one particular result when a vertical jet of water impinges on a “circular horizontal impactor.” The shape and structure of the resulting sheet of water depend on a number of factors including speed of the jet and viscosity of the fluid. See a gallery of other results at the Fluid Polygons and Polyhedra page of MIT math professor John W.M. Bush. Axisymmetric breaking instability results in polygonal structures. See link to source above. This entry was posted in Applications, Events, News, Software and tagged Altair, Autodesk, CEI, EnSight, ERCOFTAC, OpenFOAM, PBS Pro, Project Clarissian, SolidWorks, STAR-CCM+, Tecplot. Bookmark the permalink.